I'd like whatever I last "cut" with Ctrl-k in Terminal to be available in my text editor when I hit Cmd-v. Is that possible? Or something close? Update with additional explanation: Ctrl-k is by default in Terminal "delete to end of line". As well as deleting it puts the deleted text into the Terminal's clipboard (emacs "kill ring") and it can be retrieved with Ctrl-y. This is essentially a second clipboard separate from the system clipboard. I want to use the same clipboard for Terminal and for the rest of the system such as my text editor. I do not believe what you're asking is going to be easily doable. I believe the secondary cut and paste functions are isolated in each app that supports them and it would probably require programmatically trapping the target key sequence and processing accordingly. This is something that would probably need to be written in C and or Objective-C, compiled to executable and stay memory resident. That said though, I believe that the ^K shortcut only cuts the last line of text from the position of the cursor and places it on the secondary pasteboard. So with that as the understanding, let me offer the following as a workaround solution. 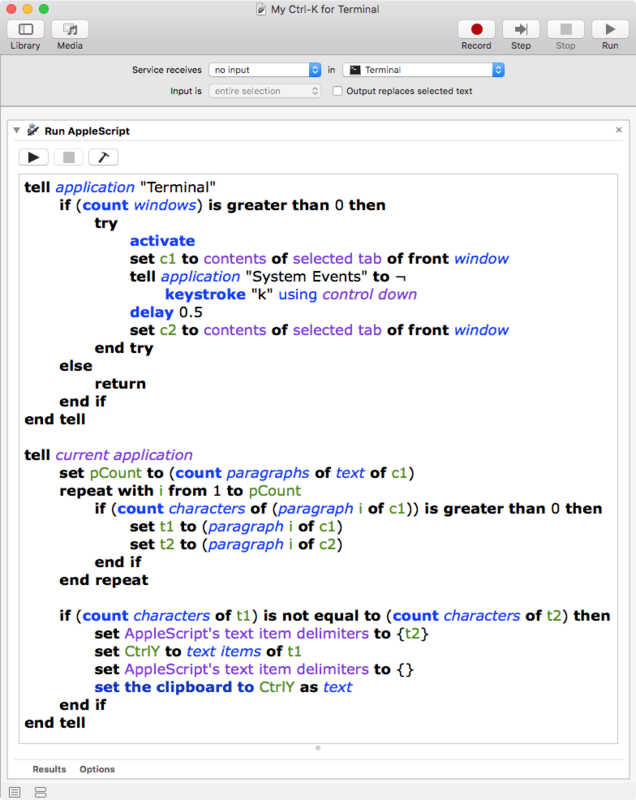 The following example AppleScript code, shown further below, will be used in an Automator service, where one can then assigned a keyboard shortcut to the service. This service will use e.g. ⌃⇧K (Control-Shift-K) and achieve the goal of the OP. Which is to get what is placed on the secondary pasteboard in Terminal, by normally pressing ⌃K, onto the general system pasteboard a.k.a. the Clipboard, albeit with pressing e.g. ⌃⇧K instead. The following was created, tested and works for me in macOS High Sierra. Select Service and click the Choose button. Configure the settings as shown in the first image below. Replace the default code with the example AppleScript code. Note: The example AppleScript code is just that and does not contain any other error handling then what may be present. The onus is always upon the user to employ proper error handling as necessary and or wanted. The value of the delay command may or may not need to be adjusted for your system. Adjust the value as may be needed and or add additional delay commands as may be needed. 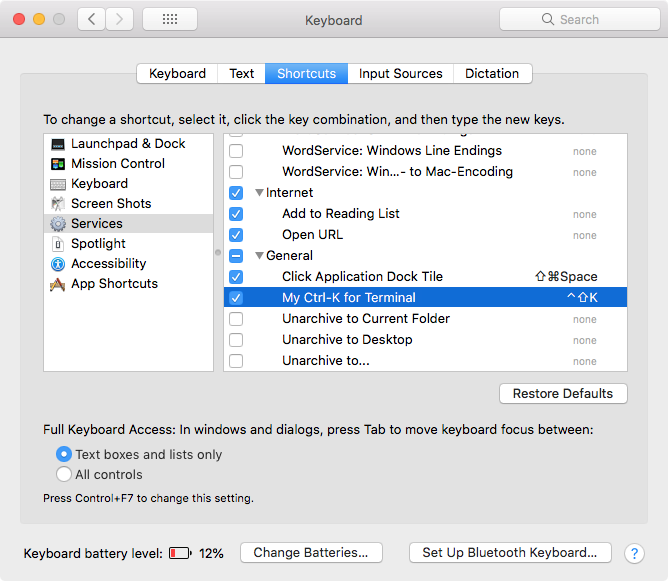 System Preferences > Keyboard > Shortcuts > Services add ⌃⇧K (press Control-Shift-K) to the My Ctrl-K for Terminal service, as shown in the image below. Now in Terminal, when one presses ⌃⇧K you'll get on the Clipboard that which ⌃K places on the secondary pasteboard. As a side note, if you use a program like FastScripts, you only need to use the example AppleScript code as a .scpt in Script Editor, not create an Automator service and can assigned the keyboard shortcut in the Preferences for FastScripts. None of the other instructions apply unless you want to do it all natively without the use of third-party software. Note that I am not affiliated with the developer of FastScripts, just a satisfied user. Not the answer you're looking for? Browse other questions tagged terminal copy-paste . There are settings for the clipboard? There is a way to copy control characters?